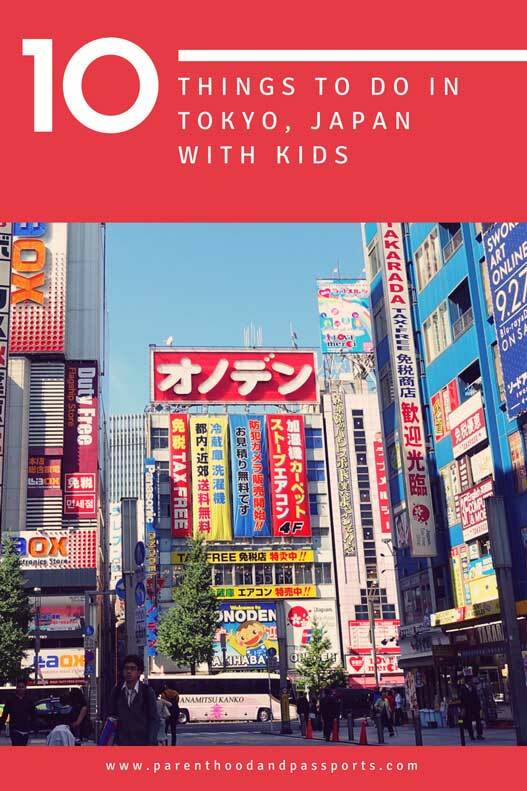 From neon lights and tall buildings to theme parks and quirky dining experiences, visiting Tokyo with kids will be one that your children remember for years to come. In fact, the entire country of Japan is an incredible place to visit as a family. Tokyo was our last stop on our 2-week trip to Asia, which included a short stay in Beijing, China, and 10 days in Japan. 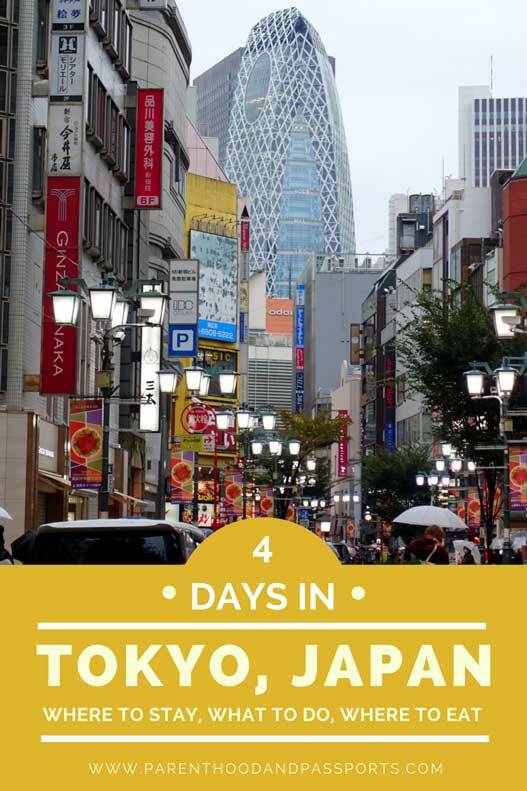 We spent four of those days exploring Tokyo and the surrounding area, although giving yourself five days in Tokyo or more would be even better. We arrived by train from Kyoto. Japan has an awesome public rail system! Navigating the rail system in Japan can be overwhelming at first, but is fairly easy once you get the hang of it. We arrived at Tokyo Station, which is in the center of the city. This is the primary train station that connects Tokyo to other cities across Japan. Tokyo Station is a site to see itself. Kids will particularly like choosing a toy from one of the dozens of capsules toy vending machines clustered together inside the train station. Vending machines are quite impressive in Japan. You can get everything from toys, to beer, to full meals in a vending machine. In and around Tokyo Station, you’ll find plenty of great places to buy unique and meaningful souvenirs from Japan. There are several convenient neighborhoods in Tokyo where you can stay if you are visiting as a tourist. 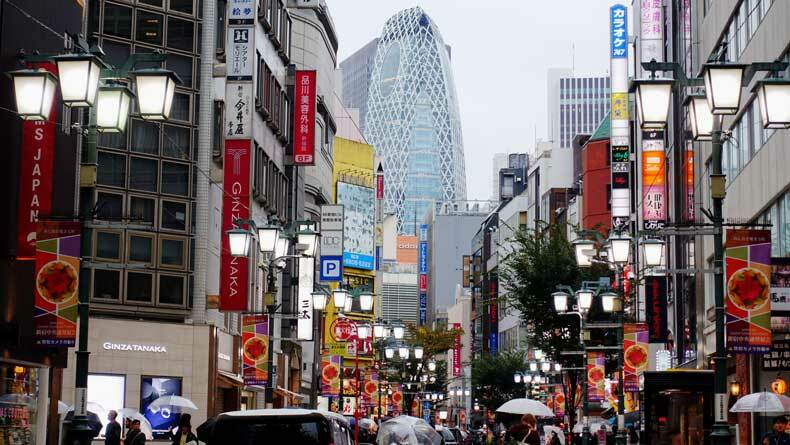 Shinjuku, Shibuya, and Ginza are perhaps most popular. Ginza is the area nearest to Tokyo station. Many chose to stay here for the sheer convenience of being close to the main train station, a lot of restaurants, and great shopping. This is exactly what we did. Not having to take another train or the subway with all of our luggage was a huge bonus to staying near Tokyo Station. The hotel prices can be quite high in the area, but we found Hotel Abest Ginza Kyobashi reasonably priced and just a couple of blocks away. Having just come from an incredible, spacious townhouse in Kyoto, we found the rooms at Hotel Abest nice but extremely small. The bathroom was about the size of a hotel lavatory, and the complimentary breakfast was not the greatest. 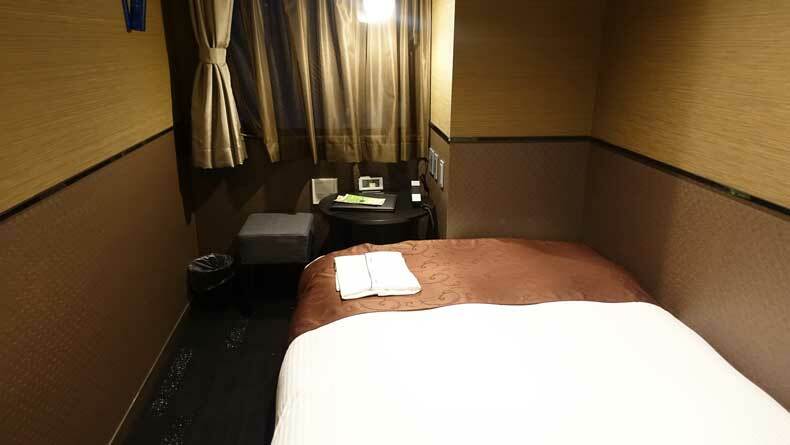 However, the location was nearly ideal, the price was within our budget, and small rooms are somewhat standard in Tokyo. There is also a metro station just around the corner from the hotel, which made it easy to get around Tokyo with kids. CLICK HERE TO CHECK PRICES AND BOOK A ROOM AT HOTEL ABEST OR READ OTHER TRAVELERS’ REVIEWS HERE. I have this bad habit of planning 80% of a trip and then arriving at our last destination completely clueless of what to do. This is exactly what happened when we arrived in Tokyo. 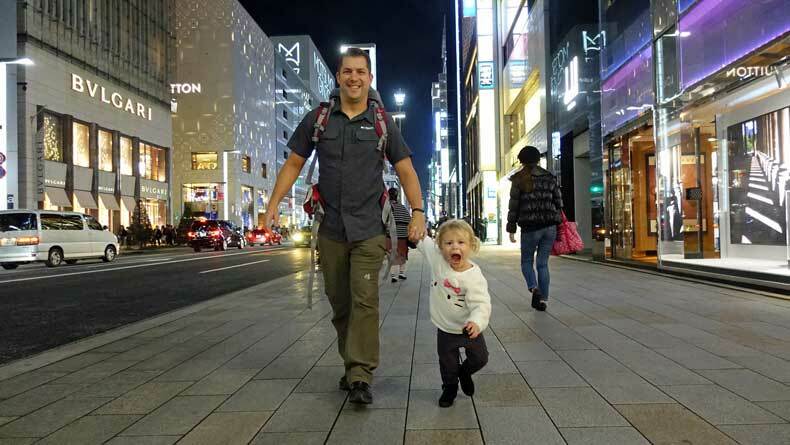 I had done very little research on what to see or do in Tokyo with kids. I knew about DisneyWorld and DisneySea, but since our daughter was still a toddler, we decided to hold off on visiting a theme park until she is a little older. If you only have 3 days in Tokyo I would skip Odaiba and Akihabara. While both districts are unique and can be fun for kids, your Tokyo itinerary can easily be reduced to three days if you decided to leave these areas of Tokyo out. We took a day trip to the town of Hakone, near Mount Fuji, during one of our four days in Tokyo. While it was incredible, if you plan to visit one of the Disney theme parks and you have only a limited number of days in Tokyo, I would recommend skipping Hakone and doing Disney instead. Here are 10 other wonderful things to do in Tokyo with kids. 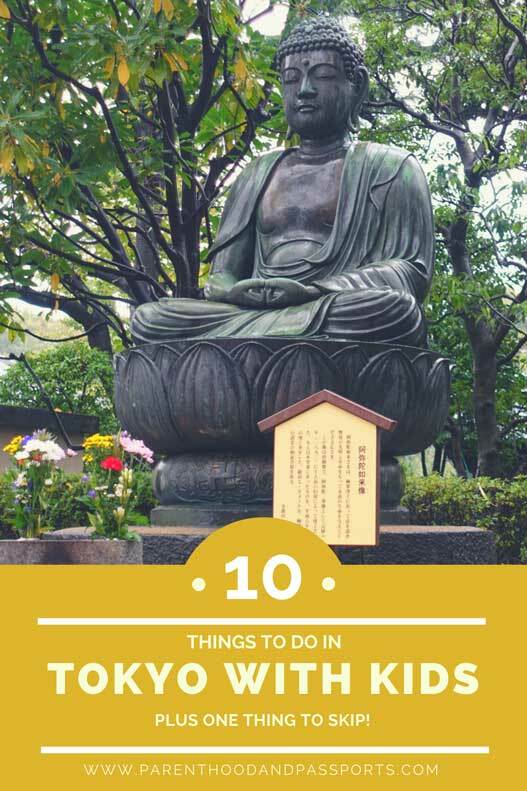 And if 10 isn’t enough, read about some of the most quirky, and unique things to do in Tokyo that you might want to add to your itinerary. The first thing we did when we arrived in Tokyo, after dropping off our bags and checking into our hotel, was head to the area of the city known as Shibuya. Shibuya is home to the busiest crosswalk in the world. Often called ‘The Scramble’, at its peak time of day, 3,000 people cross the street at the same time. The look on our daughter’s face says it all. This busy crossing area can be overwhelming. There are so many people, bright lights, and big city sounds that Shibuya can be somewhat of an assault on the senses. But it is a sight worth seeing. To escape the chaos of the crowds, head into one of the specialty chocolate shops in this area of Tokyo and indulge in a sweet treat. Shinjuku is another district in Tokyo that is large, and at times, overwhelming. 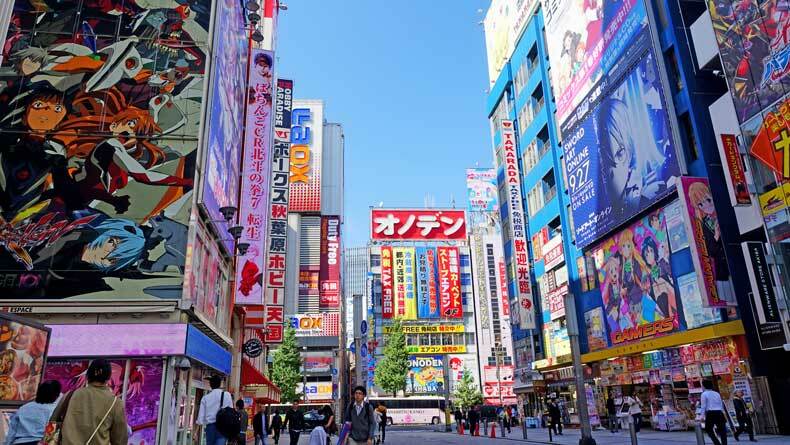 In this particular area of Tokyo, you’ll find a several ‘only in Tokyo’ experiences, including the famous Robot Restaurant, various cat cafes and other animal cafes, and Piss Alley. Piss Alley is a narrow side street lined with small bars and cheap food stalls. Piss Alley got its name in the 1940s when it was an illegal drinking spot. Because of the lack of public restroom facilities, patrons who had a few too many would wander off and relieve themselves on the nearby train tracks, thus earning this small street it’s lovely nickname. It can get quite crowded, so I’d recommend visiting on a weekday if possible. If you’re a meat eater, definitely grabbing some yakitori while you’re there. Yakitori is a small skewer of flavorful grilled chicken, and basically the only thing our toddler wanted to eat the entire time we were in Japan. If you plan to visit one of the animal cafes in Shinjuku or anywhere else in Japan, check the age restrictions ahead of time. Most of the cat cafes do not allow kids under the age of 11 to enter. The Tsukiji Fish Market is one of the most unique experiences in Tokyo. If you get there early enough (around 4 am) you can watch a live wholesale fish auction. Buyers gather six days a week to bid on the fresh fish and seafood just caught and unloaded that morning. We did not wake up early enough to attend the auction, but the market is still worth visiting later in the day. Both inside and outside of the market, you’ll find vendors selling the freshest sushi and seafood you will ever taste. 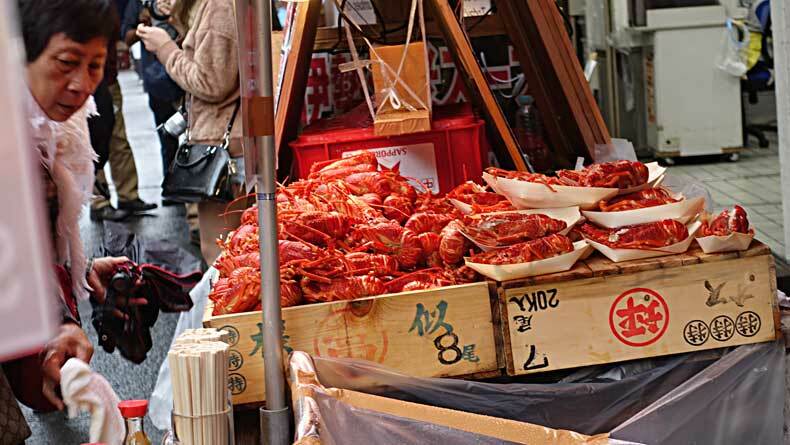 Tsukiji Fish Market is a foodie’s paradise! We ate until we couldn’t possibly eat anymore. For children who are less adventurous eaters, there are stalls that sell things other than fish. In fact, you can find all sorts of unique and delicious foods from Japan. You can purchase things like gyoza, yakitori, fruit, and mochi, all of which children will love! The Imperial Palace and outer gardens is perhaps the most iconic setting in Tokyo. Although you can’t actually enter the palace or inner gardens, the outer gardens are lovely and offer a fair amount of space for kids to run around. This is just one of many incredible parks and gardens in Tokyo. 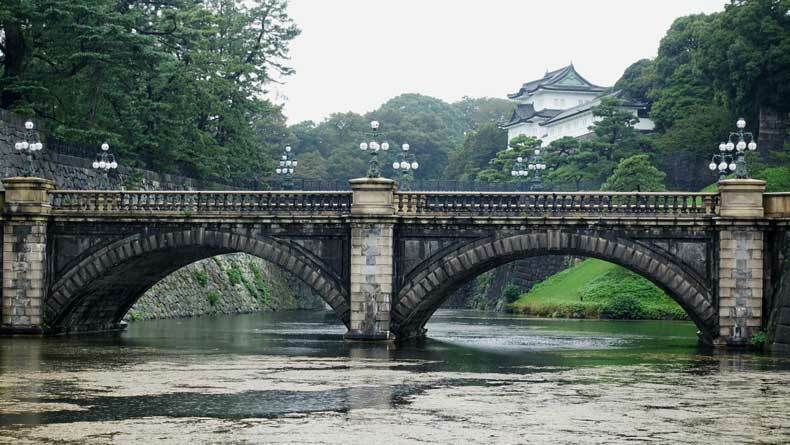 The Imperial Palace is the home to the Japanese emperor and his family, and is only a 10 minute walk from Tokyo Station. The oldest temple in Tokyo, Sensoji Temple located in the Asakusa district, is a popular Buddhist temple and tourist attraction. Unlike most temples in Japan that have a very serene and calming appeal, upon entering the outer gates of Sensoji Temple, you’ll find a bustling market where vendors sell a variety of trinkets, souvenirs, and food. 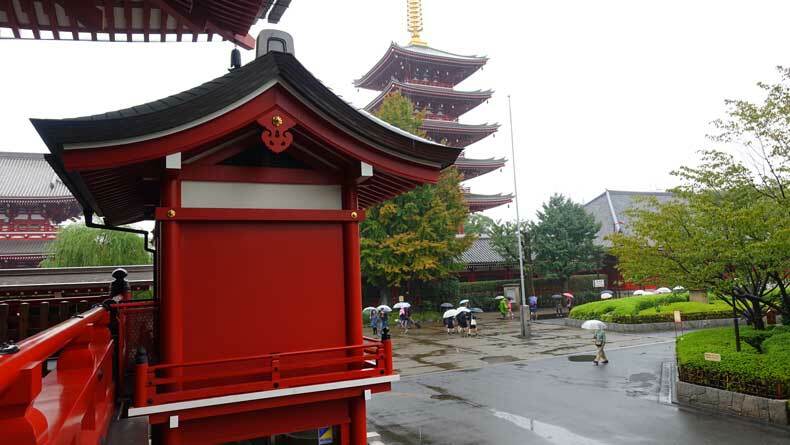 Inside the main temple area, you’ll find the main hall, a five-story pagoda, several small shrines, and different areas where you can take part in Buddhist rituals. It is a beautiful place to learn about Japanese culture in Tokyo. 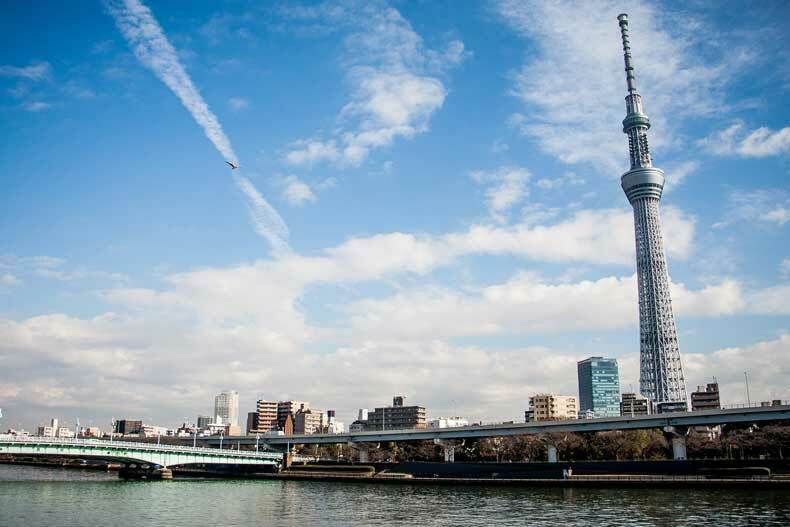 Also in Asakusa, you’ll find the tallest structure in all of Tokyo – the Tokyo Skytree. The lattice tower is more than 2,000 feet tall. From the top of the Skytree you’ll get 360° views of the city. In fact, on a clear day, you’ll be able to see the shy giant, Mount Fuji, off in the distance. Although there is a small price for admission, the views make it well worth it! Ginza, which is where our hotel was located, is a great place to window shop and people watch. Every high-end fashion brand is represented in this district. Even if you have no plans of buying anything, it’s still a cool place to visit. While we were there, we were able to watch a 3D printer building a Nissan concept car. There are also a ton of great restaurants from which to choose. Whether you want to try out a conveyor belt sushi restaurant or dine in a private room where you can close a door and keep the kids contained, there are a lot of great family-friendly options in Ginza. Odaiba is a popular shopping district in Tokyo built on a man-made island. There are several large shopping malls in this area which are great for rainy days. To get to Odaiba, you will cross one of the prettiest bridges in Tokyo, the Rainbow Bridge, which looks especially scenic at night. The area is not only known for shopping but is also a popular entertainment district. 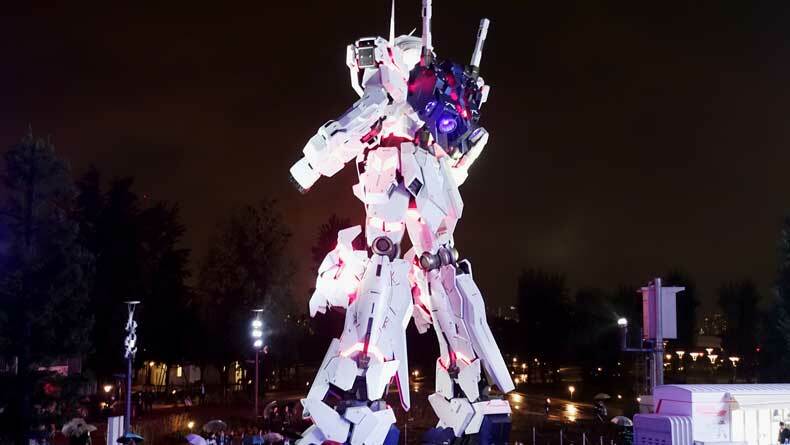 Outside Diver City Mall, you’ll find a massive Gundam statue, which is a popular robot anime series that I knew nothing about until this trip. You’ll also find one of the world’s largest Ferris wheels, a miniature replica of the Statue of Liberty, several theme parks, museums, and fun restaurants that are perfect for kids! Food is often as much about presentation as it is about taste. And when it comes to presentation, Café de Miki with Hello Kitty in Tokyo, Japan would top my list. 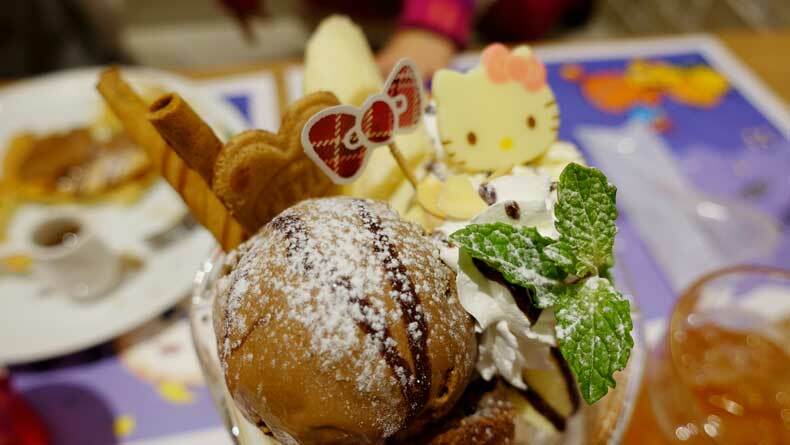 The café, which is located inside Diver City Shopping Mall, offers a whimsical dining experience centered around the popular cartoon character, Hello Kitty. This is the perfect place to enjoy breakfast (or breakfast for lunch or dinner), especially if you have children. The décor and all the food served at the cafe is Hello Kitty-themed. There is also a giant stuffed Hello Kitty at each table that kids can play with while they eat. ***Update: Cafe de Miki closed in late 2018. I’m not sure if they plan to reopen this adorable cafe. I am really hoping so, which is why I have not completely removed it from this post. If you are looking for another themed restaurant in Tokyo, click here. Akihabara is known as the electronics district in Tokyo. If your children love video games, this is the district to visit. There are even video games attached to some of the urinals in the 4-story Sega arcade. Akihabara is also the center of anime in Tokyo, which is an extremely popular form of Japanese animation. While I am not into video games or anime, I found the district encompassed the uniqueness of Tokyo in an interesting and colorful way. Sadly, not everything we did while in Tokyo was a worthwhile experience. In fact, there was one thing we were really looking forward to that turned out somewhat horrific. 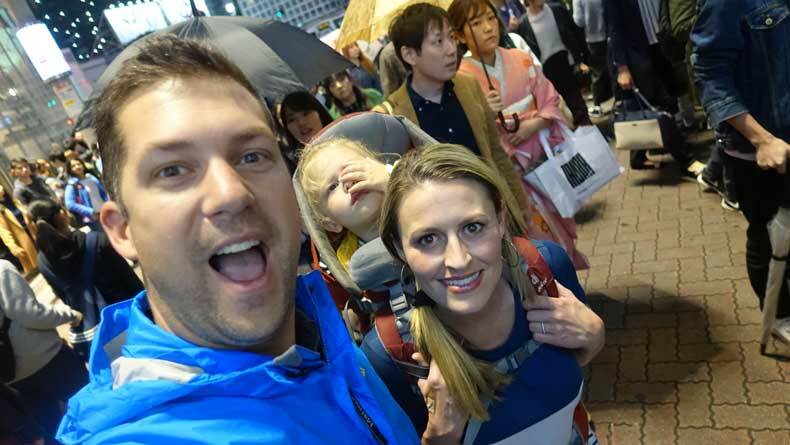 As anyone traveling to Tokyo with kids probably does, we sought out experiences that would be enjoyable for our daughter. Unfortunately, the Alice in Wonderland restaurant in Ginza was anything but enjoyable. 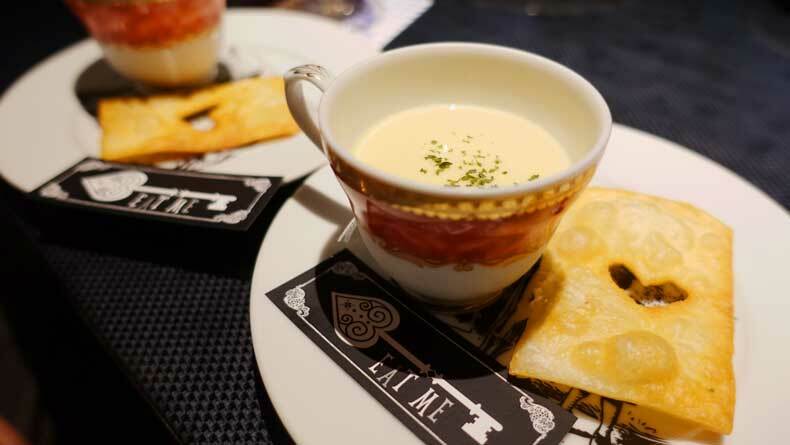 There are five Alice in Wonderland restaurants in Tokyo, each with its own unique theme. We went to the one in Ginza, which was Alice in a Labyrinth. The atmosphere and interior were really cool. You enter through somewhat dark winding tunnels while popular Disney songs play. The tunnels open up to the seating area of the restaurant where there is a giant teacup that you can dine in. The food, although very average in taste, is cute and well-presented. That is where the positives end. The restaurant is highly over-priced. There is a sitting charge added on top of the exorbitantly priced pub food. The mixed drinks are also extremely watered down, which actually turned out to be a huge blessing, because the restaurant inadvertently served my two-year-old daughter an alcoholic drink! We ordered her a milk shake, which specifically read was non-alcoholic. The drink that came out looked like what was pictured on the menu, so we thought nothing of it. Our toddler drank nearly half of it before a flustered waitress came over to tell us it had alcohol in it. You can imagine my panic as a mother in that moment. Despite the immense negligence of the restaurant, we were still presented with and had to pay the entire bill. We even had to pay for the milkshake that our daughter never drank. Needless to say, this was not a positive dining experience and I would not recommend it to anyone visiting Tokyo with kids. Tokyo was one of five cities we visited in Japan. While we loved Tokyo, there are other areas of the country that were equally impressive and family-friendly. For more information to help you plan your trip, check out all of our blog posts about Japan. 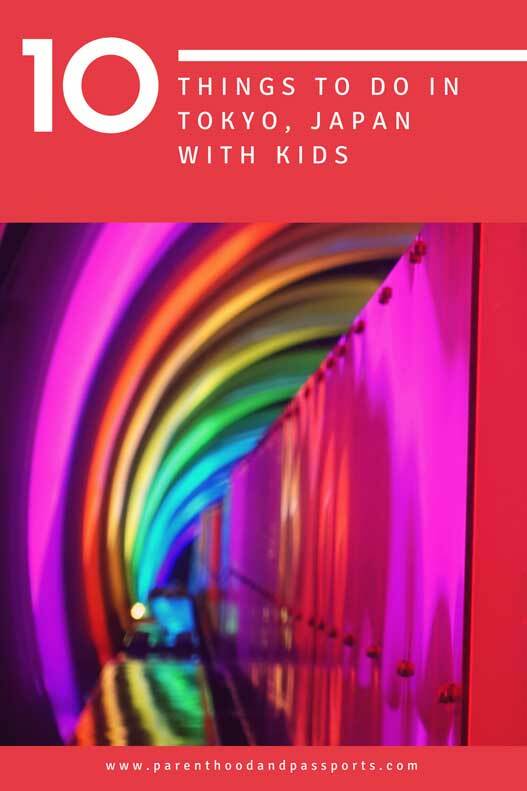 Have you been to Tokyo with kids? Let us know your favorite Tokyo experience in the comments below! Oooooh, this is perfect! We are hoping to go to Japan in 2020 with our crew. I have the EXACT SAME HABIT of planning tons of specifics about a trip — getting there, where we are going to stay, etc — and not making a list of everything we actually need to see. I’m working on it, LOL. Anyway, saving this for our 2020 planning! We want to go for the Olympics but also go elsewhere in Japan as well. Do you have your whole japan itinerary?